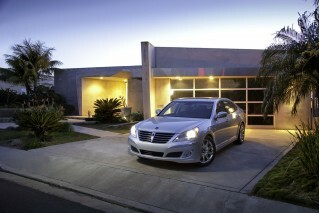 By almost anyone’s standards, the 2011 Hyundai Equus is an exceptional automobile at a near bargain-bin price. Depending upon the model you choose, you can even get a reclining and massaging rear passenger seat, as well as a rear beverage chiller and dedicated audio and climate controls. The same level of content would cost thousands more, or even tens of thousands more, if the Equus had a Lexus or Mercedes-Benz badge on the hood. As content-rich and comfortable as the 2011 Hyundai Equus was, there’s no denying that one of its most innovative features was the included Apple iPad owner’s manual. Not only could you use it to show off the Equus’ features to your friends, but you could also use it to schedule service visits, make dinner reservations or even buy concert tickets (not while driving, of course). Try that with a paper owner’s manual. Hyundai even chose to highlight the Equus’ unconventional owner’s manual in a TV spot, proving to customers that the brand once associated with disposable cars had matured into a forward-thinking automaker willing to challenge the status quo. The combination of content and value presented by the Equus proved to be a hit, and Hyundai grabbed a 5-percent share of the premium luxury sedan market in the Equus’ first year of sales. Now comes word that the 2012 Hyundai Equus will be just a bit less innovative. Gone is the Apple iPad, replaced with a conventional paper-and-ink owner’s manual. From a financial perspective it’s not a big deal, since an Apple iPad can be bought for less than one percent of the cost of a new Hyundai Equus. From a value perspective, we say it’s noticeable: the iPad owner’s manual set the Equus apart, and showed that Hyundai was capable of thinking outside the box. The 2012 Hyundai Equus will come with a larger and more powerful V-8, and, in Hyundai fashion, will likely include other updates to make it a better car than the 2011 version. Owners can still download an electronic owners manual, but now they’ll to supply their own iPad to do so. We can’t help but think that’s a step in the wrong direction.